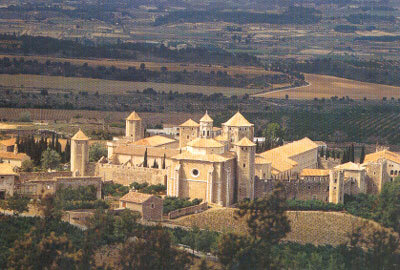 The Cistercian abbey in the woods of Poblet , Catalonia is one of the largest in Spain. The abbey is enclosed by fortified walls that have hardly changed since the Middle Ages. Interior highlights include the vaulted cloisters built in the 12th and 13th centuries , a high altar built of alabaster and carved in 1527, and the very detailed carved tombs of a number of kings from the 12th to 15th centuries. Monks were forced out of Poblet in 1835; the order returned in 1940.